Braised Italian veal shank. Another World famous dish taken from one of the least expensive cuts of meat, and elevated to a feast fit for Royalty. It seems to be lately that the poor man's dinner becomes the wealthy man's desire and the price goes up. Used to be pet food and now you can't afford it. . This is truly a very tasty and succulent dish. A true pleasure to cook and an honor to serve. 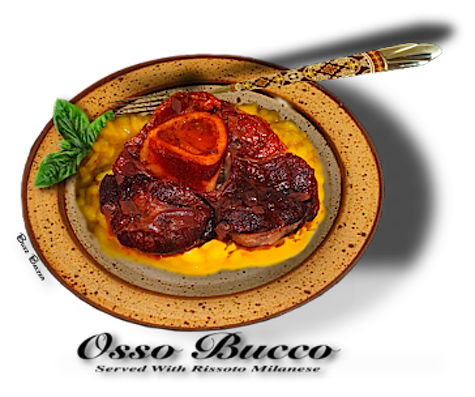 Along with the lowly braised lamb shank, the braising of these two cuts of meat from the lower leg bone of the Calf and the Lamb are an epicurean delight. 1. Preheat oven to 325°F. Dredge veal in flour, shaking off excess and season with salt and pepper. until browned on all sides. Transfer veal after it browns to a platter. carrot and garlic and cook, stirring occasionally, for 5 minutes. stirring often, until lightly thickened. 7. Make gremolata: In a bowl combine all ingredients. 8. To serve, arrange veal on platter, spoon sauce over veal and sprinkle with gremolata. 9. Serve over your favorite, risotto,  noodles,  mashed potatoes,  polenta or other starch dish.